Shining and gracious in youth, gigantic and glorious in age, possessed of a fragrant wood of great beauty and scores of the most valuable uses, the Port Orford Cedar has but one defect with which it can be reproached: there isn't - and never has been - enough of it! The shop hygrometer reads 54% RH, way too humid for me to be glueing rosettes into guitar tops. A big thunderstorm is moving in, I hear the rain on the roof and wonder when I will have to turn off the computer because the lightning strikes are getting too close. We need the rain, last week the daily temperatures were up in the mid 70's, that is warm for 8,500', the pine needles on the forest floor were getting crunchy and with all the "campers" coming up from the Denver metro area to camp in our backyard, Arapahoe National Forest, which borders our property, there is concern for wildfires. Not all who come to the forest believe in listening to Smokey Bear and we don't want another fire season like we had in 2012 when a lot of Colorado's forests went up in smoke and flame. I picked up a nice little Stanley No.2 hand plane this month to use to plane the sides of guitar neck headstocks. 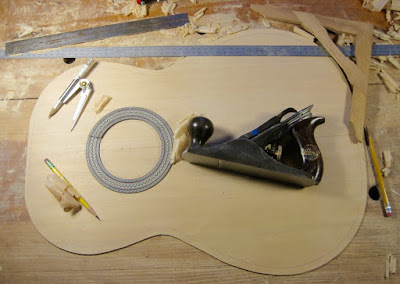 It is also handy to help level a guitar top. This particular top is reclaimed Port Orford cedar, purchased from Oregon Wild Wood, that is going to be paired with Indian rosewood back and sides. I am using the plantilla of the famous 1912 Manuel Ramirez guitar that was owned and used by the great Andres Segovia for this guitar. I will also be making another guitar on this plantilla with a Western red cedar top and black cherry back and sides. I look forward to making these guitars. Why use Port Orford cedar for a guitar top? 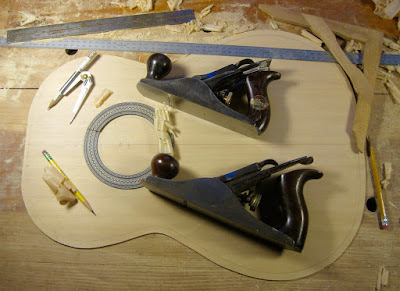 First of all, the wood's scent is intoxicating, a ginger spice aroma that carries me to the coastline of the extreme northwest corner of California with its wonderful forests; secondly, it is stronger and harder than Sitka spruce and it is just as light making it a perfect tone wood for classical guitars. Click here for the Forest Products Laboratory Wood Properties (Techsheets) - North American Softwoods and check the specs yourself. Why buy a vintage Stanley No.2 hand plane instead of a brand Lie-Nielsen? Aesthetics mostly. This little plane has really nice rosewood handles, I like the look of the iron metal with the black japanning and the little "Sweetheart" emblem that is stamped on the plane blade. It also goes well with the rest of my vintage Stanley planes and it is awfully cute!